Fennel has been used as a medicinal and culinary herb since the times of the ancient Greeks. In medieval Europe fennel was thought to ward off evil spirits on Midsummers Eve. Fennel resembles dill in the garden with its bright, yellow flowers in large, flat terminal umbels, and green feathery leaves, however the licorice aroma makes it easy to tell the two apart. Fennel seeds brew up a tasty, licorice flavored tea. Great by itself, or as a flavorful addition to other herbal blends. For those who have trouble with poor digestion, gas and bloating, a simple cup of fennel tea after a heavy meal can be the simplest and most effective remedy. Fennel increases appetite in finicky animals, reduces bad breath, belching, and acts as an antibacterial in the mouth. 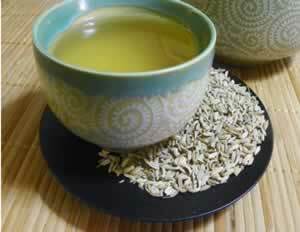 Add a small amount of fennel directly to food, or add a small amount of fennel seed tea to drinking water.